Transport Canada following up on drone vs. vehicle crash in Belleville, Ont. Transport Canada says its enforcement investigators are looking into a Belleville, Ont., crash between a drone and a vehicle last month, and that while charges may not be warranted, it's a good opportunity to raise awareness about drone safety. 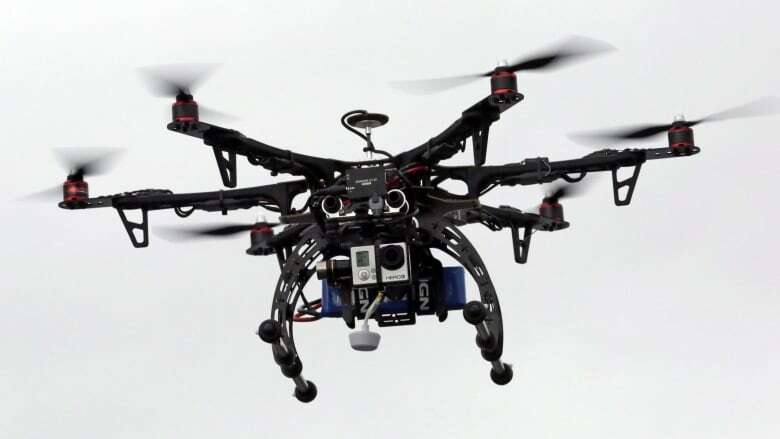 A privately owned drone crashed head-on into the grille of a moving vehicle on Old Madoc Road in Belleville, Ont., in late December, causing $1,000 in damage. "It's the first [drone vs. vehicle crash] I've heard of — and it probably won't be the last," Sgt. Kosta Brindakis told CBC News at the time. The Belleville police force determined charges under the Highway Traffic Act and Criminal Code weren't warranted in the case. Transport Canada is following up. "It may be that charges aren't warranted, but there may also be an opportunity to do some education and awareness-raising here," said Aaron McCrorie, general director of civil aviation for Transport Canada, on CBC Radio's Ottawa Morning on Monday. "The biggest challenge that we face, I think, with unmanned aerial vehicles or drones, is simply ignorance — both in terms of the operators using them ... but also for law enforcement in terms of what laws apply and what don't apply." Canada's laws haven't kept up with the "tremendous growth" in the popularity of unmanned aerial vehicles, McCrorie said, resulting in "dated" regulations that need to be strengthened. In May and June, Transport Canada asked the public for feedback on how to regulate drones and is now sorting through the comments before creating recommendations to be presented to Transport Minister Marc Garneau. Listen to the entire interview with McCrorie here. "We don't want to unduly clamp down on a recreational activity, but we want to make sure that people are doing it safely. These are airplanes, these are vehicles, and they do pose a risk to people on the ground and aircraft in the air, so we want to make sure that they're operated safely," McCrorie said. "We can't regulate common sense, and that is a challenge that we're going to have no matter where we regulate." Transport Canada recommends flying drones at least nine kilometres away from airports, no higher than 90 metres above the ground and at least 150 metres away from people, buildings and vehicles. Users must also apply for a special certificate to fly drones that weigh more than 35 kilograms.